Clops’s parents moved to New Edmonton City from Ireland when Clops was a young boy. His mother was a career waitress and his father was a highly skilled bartender. 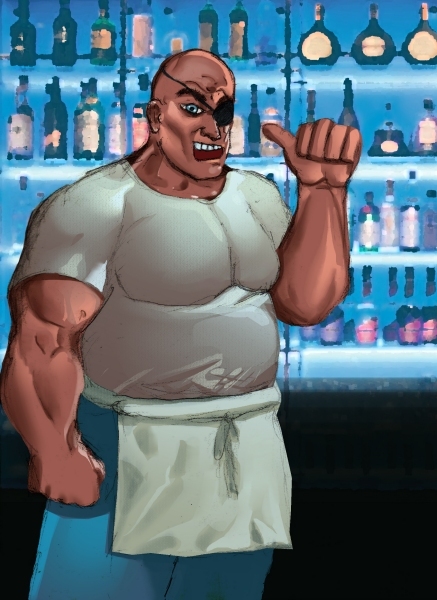 Clops’s parents named him Jerry Thomas after the 19th century bartender of the same name who is widely regarded as “the father of American Mixology”. Young Jerry learned all his bartending and flair skills from his father. After his father’s untimely death Jerry worked at several different bars, pubs, and restaurants while going to bartending school. He would always compete in the annual World Bartending Championship in Dublin, Ireland. One year, a jealous rival sabotaged Jerry’s routine resulting in a bottle cap being shot into Jerry’s eye. He lost his eye. 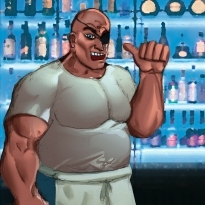 Soon afterwards, after returning home, Jerry opened his own working-class bar called the Single Eye. The patrons there soon named him Clops—a name which has stuck with him ever since. Clops has been working open–close shifts 7 days a week for the last twenty years. That is his love of bartending.